After having her second baby in January last year Shonagh McMaster decided to get back into shape and wanted a goal to help motivate her. 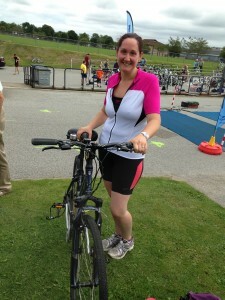 As she had always fancied doing a triathlon she set her sights on the Westhill Novice Triathlon in Aberdeenshire. Shonagh said ‘The triathlon was a great day, everyone was very friendly and welcoming and there seemed to be a lot of other people who were competing in their first triathlon too. The race was a 400m swim in a pool followed by a 16km cycle and a 3.2km run. I completed in a time of 1 hour 7 minutes which I was delighted with, having had a target of anything under 1 hour 20 minutes’. Thanks to the awesome support of her family & friends she is now slimmer & fitter than she’s been in a very long time …and perhaps looking for her next challenge!